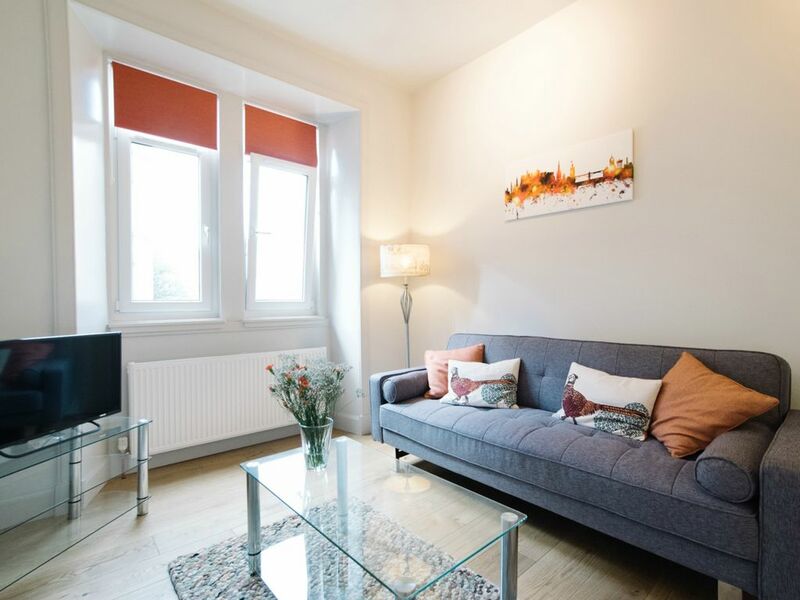 Beautiful newly renovated and refurbished first floor apartment, located in a prime city centre location only a few minutes walk from the Royal Mile and the main Festival Venues! The apartment is situated in a traditional Edinburgh Georgian building in a quiet residential area. It backs onto Holyrood Park - a popular and safe green oasis in the City Centre - and Holyrood Palace is a stone's throw from our front door... when the Queen is in residence you are quiet literally her neighbour! While we can't promise that our apartment is a match for the Queen's Palace next door - or provide you with a private butler... we can promise that you'll have a very comfortable stay here and everything you need is provided! The apartment has free super fast 100mb Wi-Fi. There are beautiful real oak wooden floors throughout with large rugs for comfort in the bedroom and living area! The apartment has an open plan kitchen and lounge area which is bright and sociable and separated by a breakfast bar. You have full use of the fully fitted and well equipped kitchen - with oven, induction hob, microwave, toaster and kettle. There is also a fridge with small freezer compartment and there is a washing machine and tumble dryer, iron and ironing board. In the comfortable and bright lounge/living area there is a flat screen TV and sofa (this can be converted into a double bed). There is a shower room with toilet. The double bedroom, with new bed and super comfy high quality mattress, has storage space to hang clothes, a mirror, chair and clean freshly laundered bed linen and towels. There is a hairdryer for your convenience. My brother and I own the property. We both live in the city centre - very close to the property. I've lived in Edinburgh for the last few years and Ben studied at the University of Edinburgh and has remained in Edinburgh ever since. We both share a love of travel and have travelled extensively - but always end up back in the world's best city, in the world's best country! We include a washing machine for your convenience. Virgin digital TV package with a number of channel options as well as Netflix and on demand apps. there is one set of stairs up to the apartment and no lift. Glad we chose Ben and Oliver’s flat behind the Palace to spend 9 days in Edinburgh. The flat was extra quiet, double bed comfortable, and owner-brothers stayed in contact before and after our arrival. A Sainsbury grocery store was within walking distance. Two tweaks I’d suggest: add a couple of luggage racks (there’s no chest of drawers) and hooks behind the bathroom door for robes, cosmetic and shaving cases. The heated towel bar was a treat. We really enjoyed our stay in Edinburgh. The flat is clean and nicely decorated. The location feels safe and the at first floor level, secure. The kitchen is practical and well equipped. Discovering Holyrood park at the end of the street was a great surprise - a scenic route into town. We hope to stay in the flat again if we return to Edinburgh. Located just by Holyrood Park this apartment is well equipped for 3 people and was really cozy and comfortable. From here we walked to lots of Edinburgh's sights and also took the bus to Leith and the train to St. Andrews. Although the weather was very cold we had bright blue skies for the majority of our time here which was great for photography. Recommended. Sparkling clean and perfect location! The apartment is sparkling clean and perfectly located for visiting the sites in Edinburgh. We would love to stay again if we get the chance to return to Edinburgh. The apartment was clean, cute, and well equipped for a whirlwind weekend trip. Checking in and out was a breeze, and the location was excellent for walking up and down the Royal mile. The recommended food and sightseeing sites were both wonderful. Definitely will keep in mind if we're ever back in Scotland for a longer stay! This is a great home base for exploring Edinburgh. Right at the Holyrood end of the Royal Mile with easy access to Arthur's Seat. The place is well set up for a stay in the city with basic amenities and a convenient location. I would be happy to revisit if I'm ever back in Edinburgh. You are based in a perfect location to enjoy the wonderful City of Edinburgh and we hope you will have a really fantastic time in our Milton Street flat and love the City as much as we do. Close to the Royal Mile in the historic heart of Edinburgh, we think our Milton Street accommodation offers the perfect location for a fantastic time. Whether you are visiting for a day or two or much longer there is so much to discover. Within walking distance of the flat you will be able to visit museums, restaurants, and shops; explore the closes, wynds and hidden gems; and enjoy beautiful views across the city to the Firth of Forth. Based in the Old Town and within a World Heritage site, the area is culturally and historically important to the city and jam packed with things to see and do. A ‘Scots mile’ long, and connecting two royal residences (the Castle and the Palace of Holyroodhouse), the Royal Mile is also home to parliaments old and new, law courts, a cathedral and churches, and a vast range of visitor attractions, walking tours, shops, restaurants, cafes and pubs. Unsurprisingly, the Royal Mile is one of the most well-known and most visited streets in Edinburgh. There are numerous attractions that are worth a visit. They include the Camera Obscura, the Scotch Whisky Experience, Real Mary Kings Close, the Museum of Childhood, the Storytelling Centre, the Museum of Edinburgh, the People’s Story Museum, the Canongate Kirkyard, and Our Dynamic Earth which nestles below Arthur’s Seat in Holyrood Park. A variety of walking tours begin on the street, with subjects to suit every taste, from history to ghosts to literature. You will find plenty of opportunities to buy cashmere, tweed, tartan and Scottish specialist food and drink. The street and closes are also home to a number of independent businesses: browse antique jewellery at Royal Mile Curios, or treat yourself to Scottish fare at Cranachan and Crowdie, Scotland’s oldest independent whisky bottler, Cadenheads, or the Cigar Box, or pick up Christmas decorations year round at Nutcracker. Specialty shopping streets such as St Mary’s, Victoria and Cockburn Streets are all just minutes away. The Royal Mile offers a range of eating out options. There are fine dining establishments such as Wedgwood, Angels with Bagpipes, Cucina at The G&V Hotel and Michael Neave Kitchen and Whisky Bar.